The number of kidney transplants has gradually increased in the last decade; it was 1742 in Japan in 2017. The outcomes have improved year by year, with the indications for transplantation expanding accordingly. 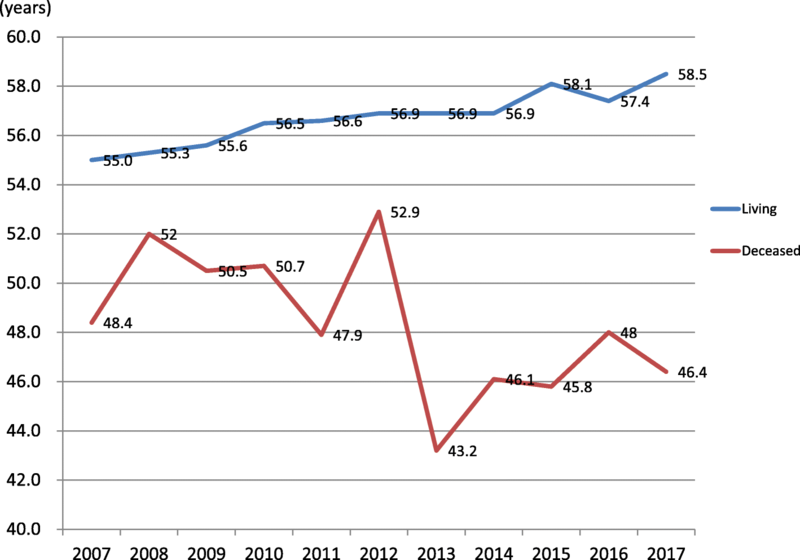 In this paper, we will report the unique trends and outcomes of kidney transplantation in Japan. The detailed transplant characteristics and outcomes are also shown as an updated version of the previous report in the Renal Replacement Therapy. Transplantations in elderly, diabetic, and ABO-incompatible living donors have been more widely performed recently, with the outcomes of these transplants having improved remarkably. However, the number of deceased donor transplants is still quite small, and further efforts to increase deceased organ donation continue to be of utmost necessity in Japan. 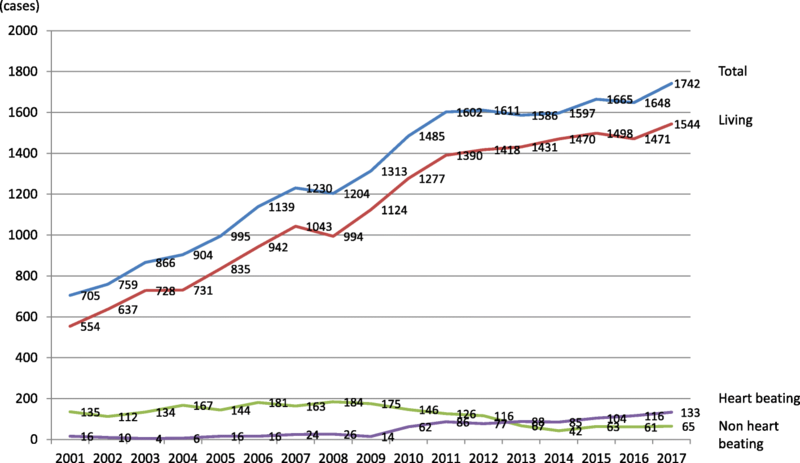 We first reported the current status of kidney transplantation in Japan in 2015 as part of the Renal Replacement Therapy . 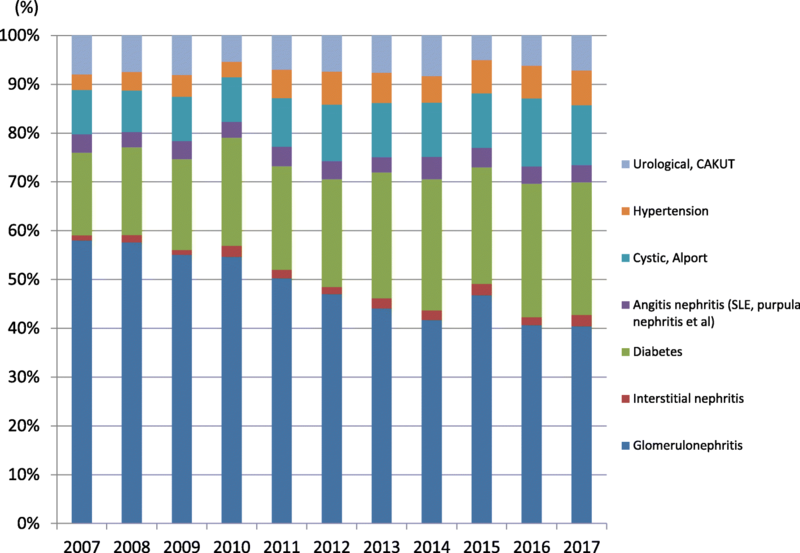 In this article, we describe the latest trends and outcomes of kidney transplantation as observed in 2017 in Japan. This report is based on the data of the annual progress report from the Japanese Renal Transplant Registry, which is published in the Japanese journal “Ishoku” , and the Renal Replacement Therapy . Since 2001, a total of 120–140 centers have performed kidney transplants in Japan . All individual data were collected from the kidney transplant centers via the electronic registry system [1, 2]. The patient and graft survival rates were analyzed using the Kaplan-Meier method. 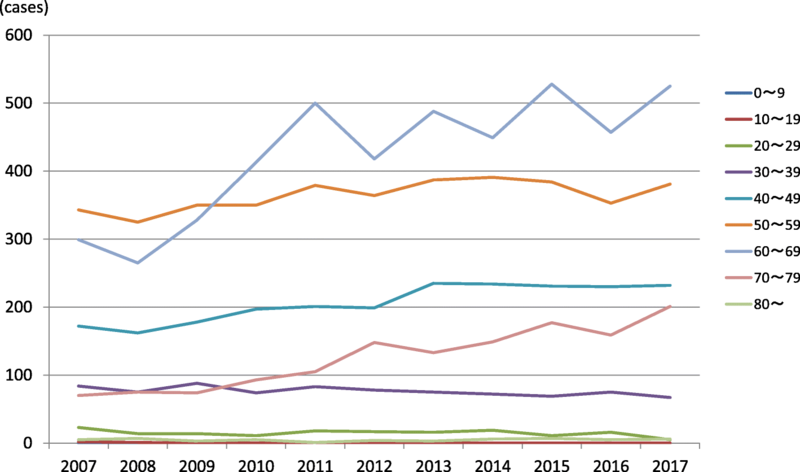 The number of total kidney transplants, including living donor and deceased donor transplants from 2001 to 2017, is illustrated in Fig. 1. The total number has increased gradually each year, reaching 1742 in 2017. The number of living donor transplants was 1544, which was the largest fraction of the total. 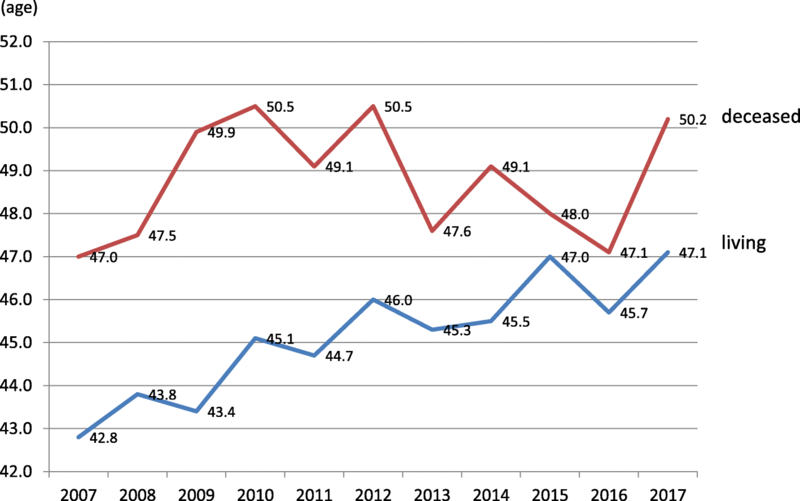 Regarding deceased donor transplants, the number of heart-beating donor transplants increased to 133; however, that of non-heart-beating donor transplants was unchanged at 65 in 2017 . In total, 90% of kidney transplants have been living donor ones and 10% have been those from deceased donors in Japan in the last few decades. A total of 120–140 centers have performed kidney transplants since 2001. Figure 2 shows the number of kidney transplant centers by the number of cases performed a year from 2007. About 40% of the centers (55 centers) performed only one to four cases a year in 2017. Twenty centers have performed more than 20 cases a year, and the number of cases performed in these centers occupied about 50% of the total in 2017. The mean age of the living donor transplants increased every year, for instance, it was 42.8 years in 2007, which increased to 47.1 years in 2017. The mean age of deceased donor transplants did not significantly change between 2007 and 2017 (47.0 years to 50.5 years) (Fig. 3). 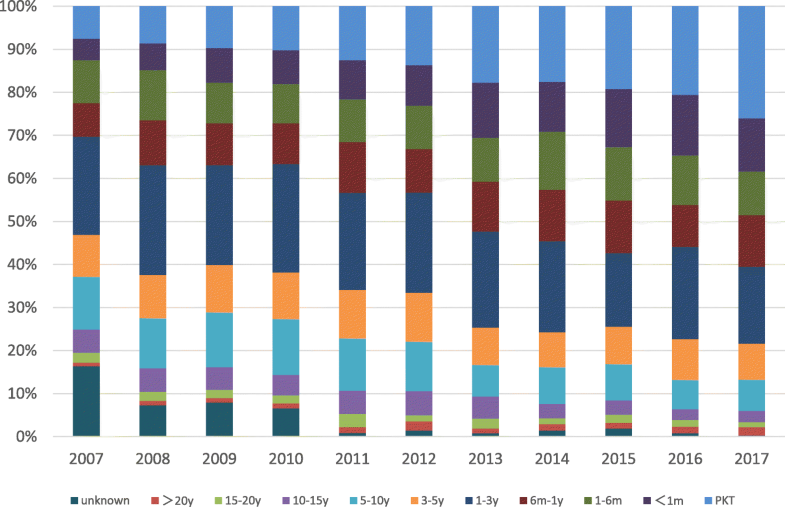 Figure 4 shows the number of living donor transplants by age (in 10-year intervals). In case of living donor transplants, the numbers for donors aged 40–49, 60–69, and 70–79 have increased since 2007. Transplants from living donors aged more than 60 years was at 24.0% in 2017. 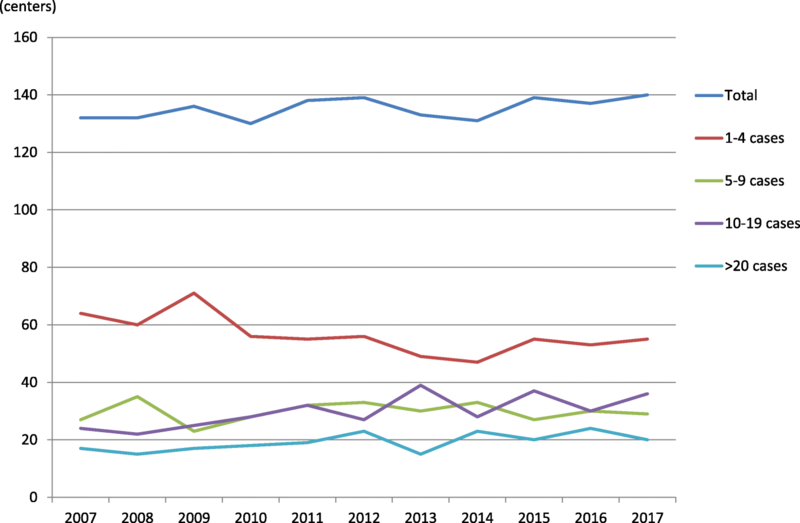 With respect to deceased donor transplants, donors aged 40–69 constituted three fourths of the total deceased donor transplants in 2017 (Fig. 5). The rate of diabetes has increased and that of glomerulonephritis has decreased since 2007. In 2017, diabetes was the primary diagnosis for about 25% and glomerulonephritis accounted for 40% (Fig. 6). Figure 7 describes the proportional numbers of preemptive transplants, transplants with preconditioning temporary dialysis therapy immediately before transplantation, and those with chronic dialysis in living donor transplants. The proportion of preemptive and temporary dialysis transplants has increased each year since 2007 and was approximately 38% in 2017. 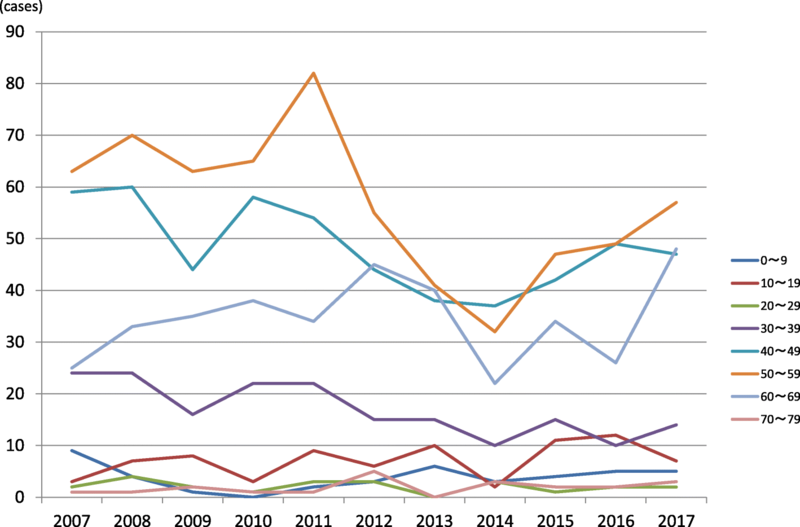 The mean dialysis periods prior to transplantation with chronic dialysis therapy were 3.1 years and 15.1 years in living and deceased donor transplants in 2017, respectively (Fig. 8). As can be observed, there was a big difference between the dialysis periods in living and deceased donor transplants. As the length of waiting time is a major factor for candidate selection for deceased donor transplants in Japan, the patients with a longer period of dialysis therapy are frequently selected, as mentioned in the previous report . The percentages of transplants by dialysis period in living and deceased donor transplants are shown in Figs. 9 and 10. In case of living donor transplants, the proportion of preemptive transplants was the highest, with that of cases with a dialysis period of 1–3 years being second. The proportion of cases with less than a 1-month dialysis period, which corresponded to preconditioning dialysis, has also increased (Fig. 9). In deceased donor transplants, the proportion of cases with a dialysis period of more than 20 years was the highest and that of cases with a dialysis period of 15–20 years was second. Overall, 71% of deceased donors had had dialysis therapy for more than 10 years before undergoing transplantation in 2017 (Fig. 10). In 1989, the first ABO-incompatible living transplant was performed in Japan , as mentioned in the previous report . 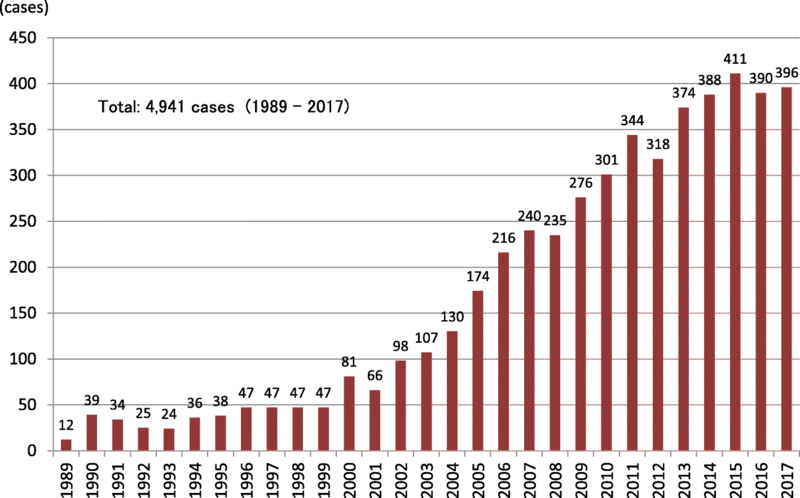 The number for this particular category has increased and reached 300 in 2010, continuing to be more than 300 cases since then (Fig. 11). In 2017, 396 incompatible transplants were performed, which formed 27.7% of all living donor transplants. In the past decades, 83%–90% of kidney donors were living donors. 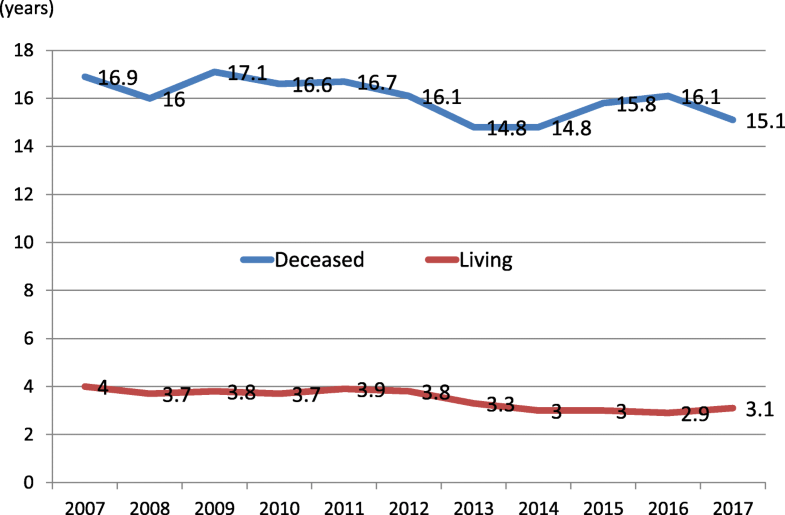 The mean age of living donors increased gradually and was 58.5 years in 2017 (Fig. 12). Donors aged 60–69 have formed the highest fraction of this category since 2010. The number of donors aged 70–79 has also increased since 2010 (Fig. 13). Also, the percentage of spouse donors has increased and was 43.1% in 2017 (Fig. 14). The mean age of deceased donors was 46.4 years in 2017. Donors aged 40–49 and 50 and over occupied 26% and 38% of all deceased donors, respectively. The overall patient and graft survival rates, along with the causes of death and graft loss, were analyzed. The rates were analyzed using the Kaplan-Meier method, stratified by the year of transplantation, under timespans such as 1983–2000, 2001–2009, and 2010–2016. In addition, these analyses were stratified by age, diabetes, preemptive, dialysis periods, and ABO blood type incompatibility in living donor transplants performed after 2001. The patient and graft survival rates have increased in order of the time of transplantation (Table 1). Regarding patient survival for transplants performed after 2010, the rates were 99.2% in 1 year, 97.1% in 5 years for living donor transplants and 98.0% in 1 year and 93.1% in 5 years for deceased donor transplants. With regards to the graft survival, the rates were 98.7% in 1 year and 94.3% in 5 years for living donor transplants and 96.7% in 1 year, 88.0% in 5 years for deceased donor transplants. Infections, heart diseases, and malignancies were major causes of death (Fig. 15). 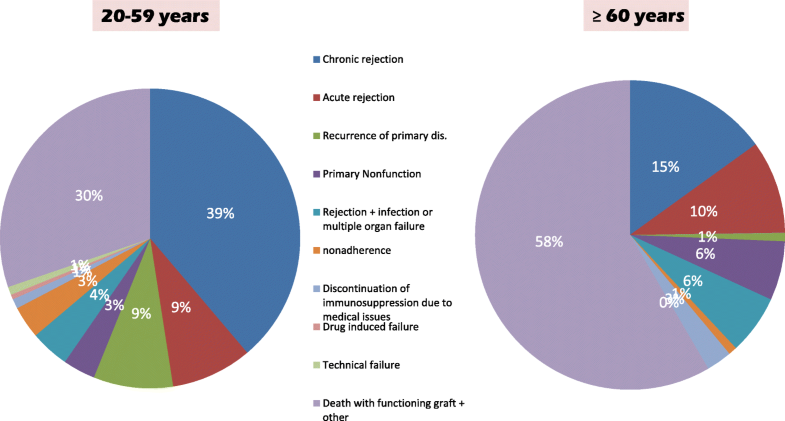 Chronic rejection and death with functioning graft constituted about 60% of graft loss causes in all transplants (Fig. 16). 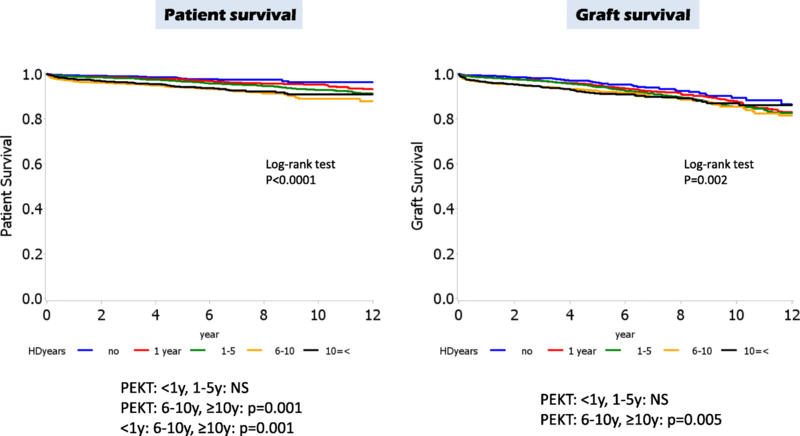 Graft survival and patient survival rates for patients were analyzed and stratified by age, such as those aged less than 19 years, those aged 20–59 years, and those aged more than 60 years in case of living donor transplants performed after 2001. 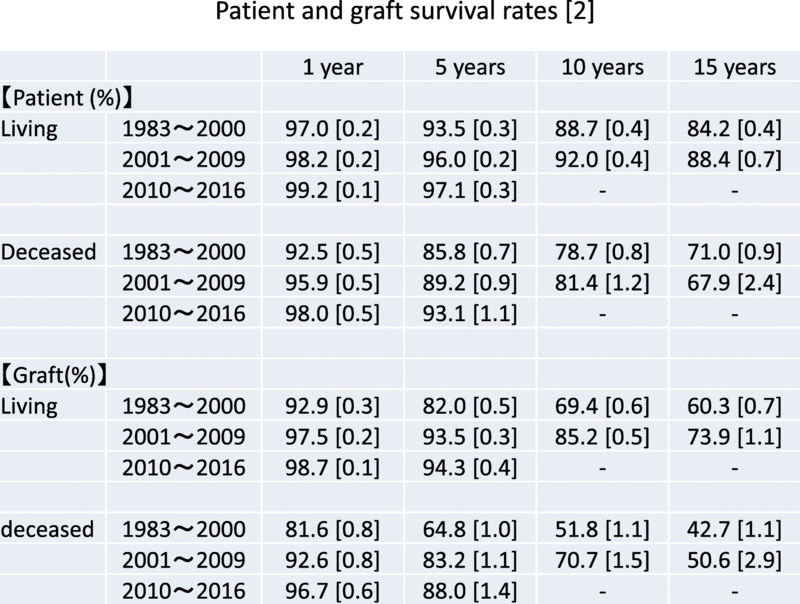 For both graft and patient survival, the rates in 1, 5, and 10 years were the lowest in transplants aged more than 60 years (Fig. 17). 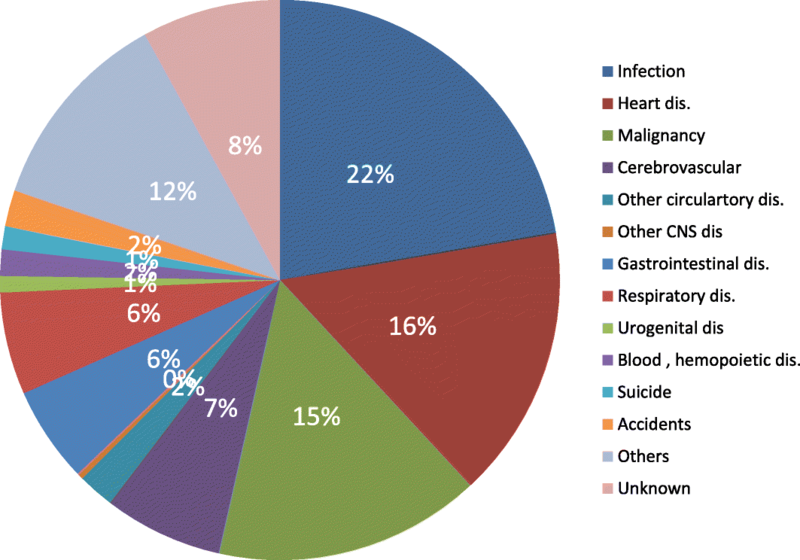 The major causes of death were similar in both under and over 60-year-old patient transplants (Fig. 18). Regarding the causes of graft loss, 58% were death with functioning graft in transplants aged over 60 years. On the other hand, the biggest cause in transplants aged less than 60 years was chronic rejection, followed by death with functioning graft (Fig. 19). 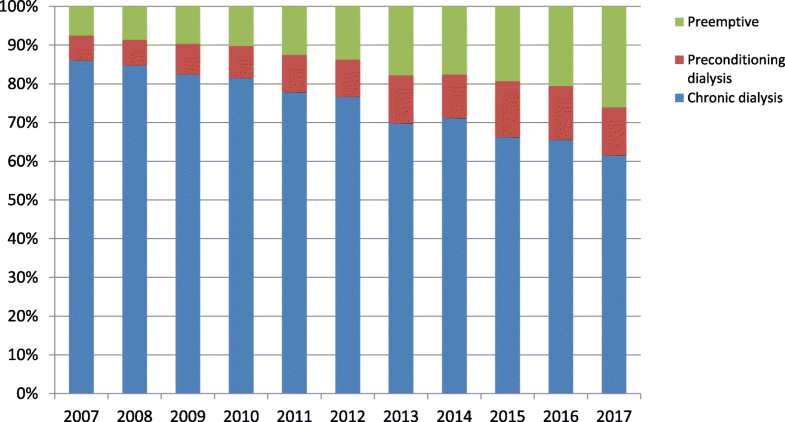 The patient and graft survival rates in diabetic transplants performed after 2001 were the same as those of non-diabetic transplants in 1 year; they were, however, lower in 5 and 10 years after transplantation, as compared to non-diabetic transplants (Fig. 20). 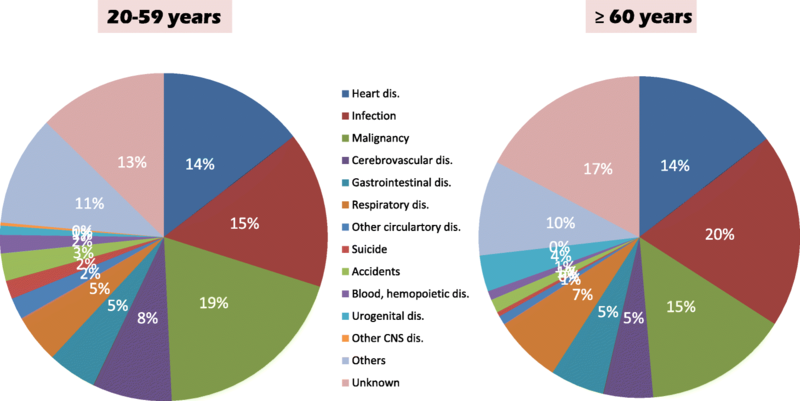 Infections, heart diseases, and malignancies were major causes of death in both diabetic and non-diabetic transplants (Fig. 21). 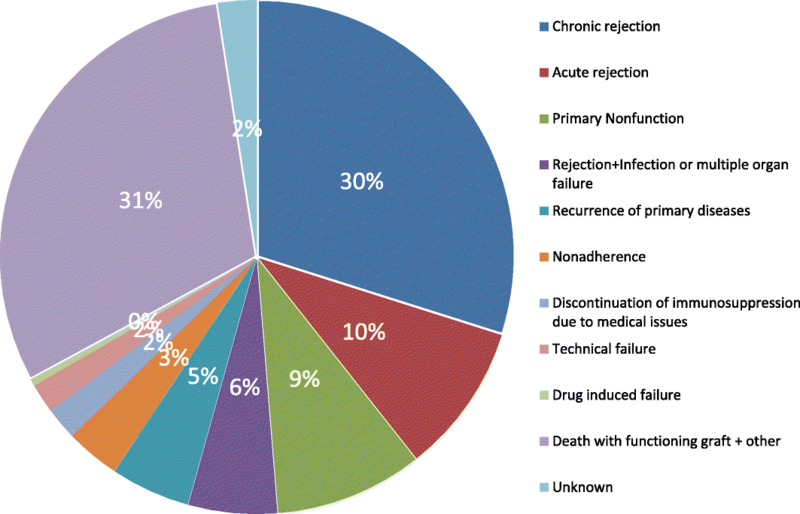 With respect to the causes of graft loss, while chronic rejection was the main cause in non-diabetic cases, death with functioning graft was the largest cause in diabetic cases (Fig. 22). Preemptive transplants had significantly superior patient and graft survival rates than those with dialysis therapy (Fig. 23). According to the analyses, which were stratified by dialysis periods, these rates in preemptive transplants were the same as those in transplants with dialysis periods of less than 5 years. 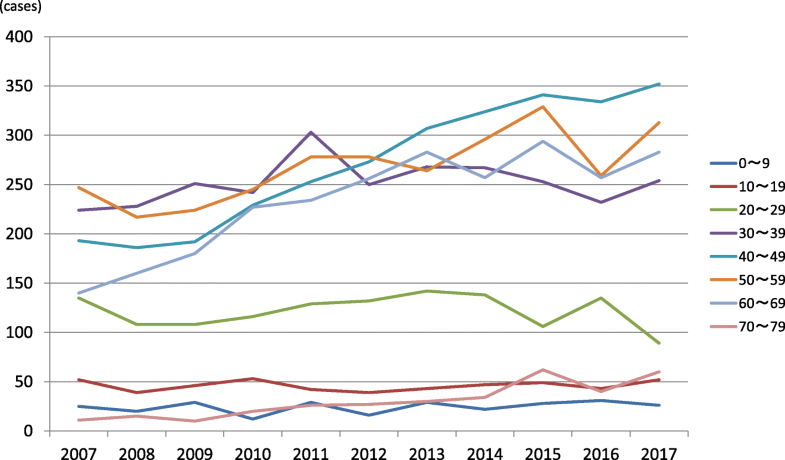 The rates in preemptive transplants were higher than those in transplants with dialysis periods of more than 6 years (Fig. 24). The rates for patient and graft survival were slightly higher in ABO-compatible transplants than those in ABO-incompatible transplants. 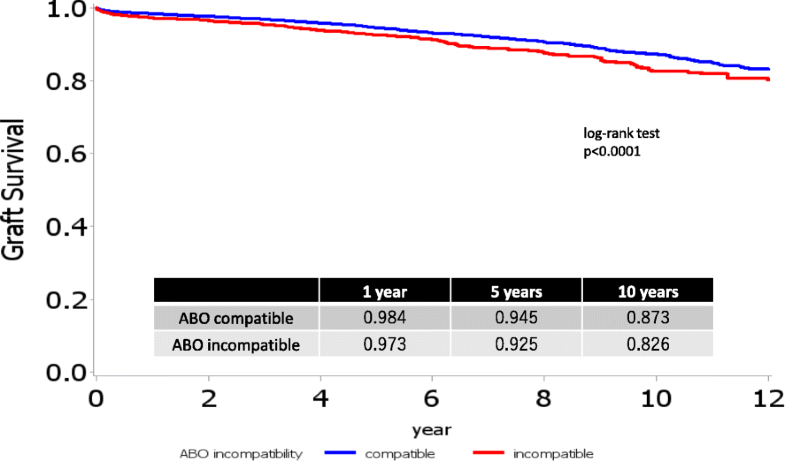 The graft survival rates were 98.4% and 97.3% in 1 year, 94.5% and 92.5% in 5 years, and 87.3% and 82.6% in 10 years for ABO-compatible and ABO-incompatible transplants, respectively (Fig. 25). The number of living donor transplants, especially elderly transplants, has increased each year in Japan. Diabetic and preemptive living donor transplantations have also been performed widely in the last decade. In addition, ABO incompatibility has ceased to be a barrier to transplantation, and this type of transplant forms about 30% of living donor transplants now. The patient and graft survival rates have improved according to the time of transplantation, especially in the short term, such as within 5 years after transplantation. Lengthening the survival time is an important issue, particularly in diabetic and/or elderly transplants. Chronic rejection due to antibody-mediated reactions and death with functioning graft is also formidable problems that need to be resolved. The number of deceased donor transplants is still very small, leading to the persistent need for further efforts to increase deceased donation in Japan. Authors who are members of the Kidney Transplant Registry committee carried out the analyses of the data and approved the manuscript. All registered data were approved by each transplant center.